It’s been a while since we’ve seen a new steampunk-inspired device, and this one looks pretty cool. The Tesla Nano 120W Steampunk Mod is constructed of zinc alloy and sports a unique steampunk-style inlay pattern that really makes it pop! Powered by dual 18650 batteries, it comes in black, bronze, copper or stainless steel finishes. 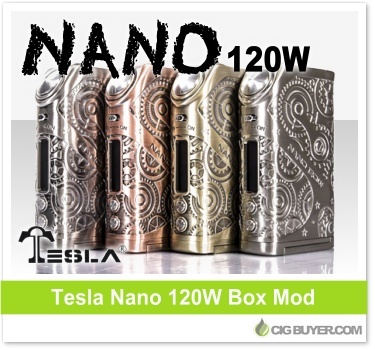 The Tesla Nano 120W Box Mod provides up to 120W of output with temperature control (Ni/Ti/SS/TCR) and features a bright OLED screen, ON/OFF toggle switch, oversized firing button and more.